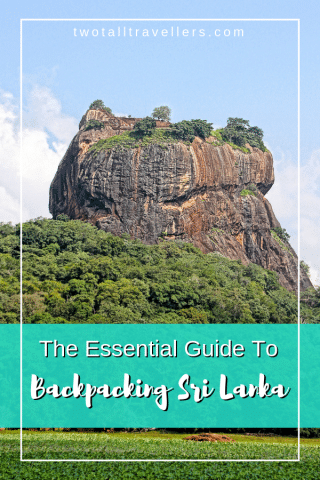 This guide will tell you everything you need to know in order to backpack Sri Lanka in the best way possible. We’ll give tips, recommendations and a suggested itinerary that will help you plan your trip to this awesome island country! Sri Lanka might not be on the popular south-east Asia backpacking route but it really is somewhere not to be missed. It’s a beautiful country with so much to see and do, and it should definitely make your bucket list. How long should I backpack Sri Lanka for? What is a realistic budget for a backpacker in Sri Lanka? What is the best 4G sim card to buy in Sri Lanka? Which is the best train route in Sri Lanka? 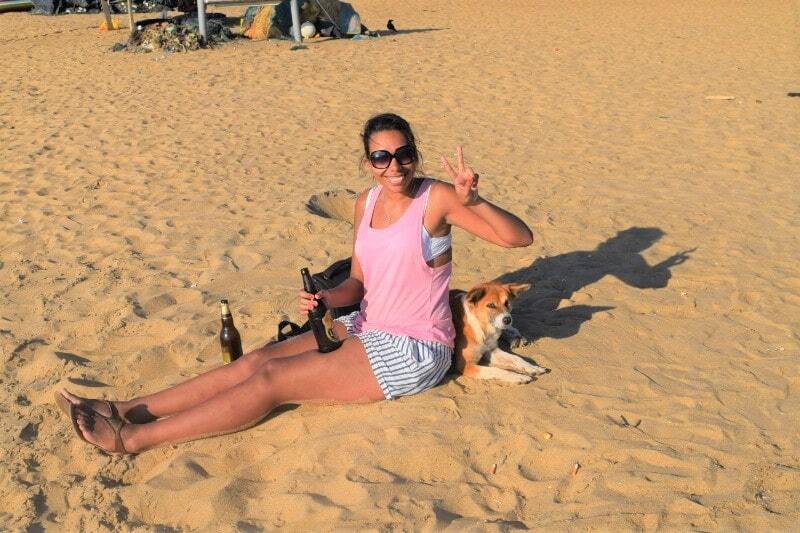 Can you drink alcohol in Sri Lanka? Is there malaria in Sri Lanka? What is the main religion in Sri Lanka? Does Sri Lanka have a tipping culture? Compared to somewhere like the UK or the US, Sri Lanka is a very budget-friendly destination. It can easily be explored without spending thousands of dollars. It can be pricier than places like Thailand or Bali in terms of accommodation and alcohol, but for food, attractions and transport then it’s very affordable. It’s extremely easy to get a visa if you’re going to backpack Sri Lanka. You’ll need to pay $35 unless you’re from one of the SAARC countries (such as India, Bangladesh, Pakistan and more). Nationals from The Maldives, The Seychelles and Singapore are also exempt from needing a visa to backpack Sri Lanka. You can get a visa online here before you travel and it shouldn’t take more than a few hours to receive it, or you can wait until you get to the airport. This visa gives you 30 days in the country, but you are able to extend it twice during your stay. A Sri Lankan visa is pretty simple to obtain, and I would advise to always get one in advance. It will reassure you that you won’t be refused on entry. Not only that but the queue for the visas on arrival was HUGE when we landed. The line looked like it would have taken around 2 hours to get through – not ideal after a long flight! We already had our visas so we went straight through immigration after about 10 minutes! As with most Asian countries, you’ll need to make sure that you’re vaccinated against certain diseases before you go. Talk with your doctor or nurse around 2 months before you travel so that they can advise you on what you need and how long it will take to administer it. Remember that some vaccinations will take more than one visit to the doctor. There are hundreds of stray dogs in Sri Lanka. They can obviously be dangerous but this one just wanted to use me for shade! The internet has some good information, but getting face-to-face advice from a medical professional will always be best. 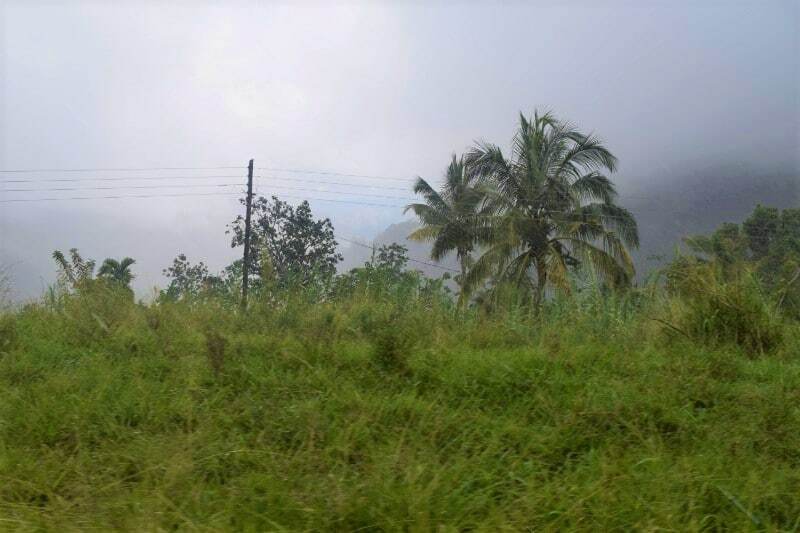 Sri Lanka is actually one of those places that you can visit most times of the year because the regional differences in weather are astonishing! There are two monsoon seasons that occur at opposite times of the year, and one small inter-monsoonal season in around October/November that can send rain throughout the country. Avoid those two months because thunderstorms can occur anywhere and for random amounts of time. It could mean that your whole trip is ruined by the weather if you plan your trip then! In the northeast, the rainy season starts from November until around March. If you can, visit this region from around April until September. Sri Lanka’s south and southwestern towns are best seen between December and March. It’s the peak season, but it means that you’re almost guaranteed the nicer weather. The average temperature in Sri Lanka is pretty stable all year round, at between 26 degrees and 30 degrees. However, the humidity can be quite high! The temperature will also drop quite considerably with altitude increase. If you plan on visiting Kandy, Ella and Nuwara Eliyathen then bring a light jacket for the day and a jumper for the evenings to keep a little warmer. For a comprehensive breakdown of this list go to our budget savvy packing list guide. If you are going to backpack Sri Lanka you’re going to need decent luggage. I’d recommend a holdall over a typical rucksack because they’re more accessible, especially if you usethese packing cubes! You also don’t have to carry 20kg of weight wherever you go – just pick up the bag and put it down when you need to. Sometimes backpackers choose the biggest bag and most stereotypical hiking bag just because they’re off to Asia (guilty!) but they’re not necessarily the best option! Remember to pack an empty day bag in your main luggage too though because you’ll need something to carry your things if you hike Adam’s Peak or if you go to the beach. Just like in most countries with sacred temples, backpacking Sri Lanka means that you have to respect the request to cover up your knees and shoulders when visiting a religious building. If you want to wear a dress, choose airy but modest ones to wear and take a shawl too. A pack of everyday t-shirts should be fine, and over-the-knee shorts are acceptable too. If you are planning to bronze up, don’t worry because you should still pack your bikini or those funky swimming trunks. On the beaches, it is fine to wear swimwear – just don’t walk around with no top on in the supermarkets! Take a mini medical kit with you so that you don’t have to rely on finding a pharmacy if you become ill really quickly. Make sure it includes things like diarrhoea tablets, plasters, paracetamol and insect bite cream. You can pick up all of those things in Sri Lanka but if you fall ill in the middle of the night then it is best to be prepared! If you plan on taking a boat tour, you might want some sea sickness tablets or motion sickness relief bands. The water can get quite rough and you don’t want to be trapped on a boat feeling queasy! I would recommend taking a brand of tablet that you know and trust works for your body – we bought tablets at a local pharmacy and they were incredibly drowsy so not great for a sightseeing tour! Rough seas are not my friend! You can’t drink tap water in Sri Lanka, and buying plastic bottles every time you need a drink is becoming less and less acceptable considering the effect plastic has on our environment. Invest in a reusable filter bottle – you’ll be able to drink the tap water so not only will you b more eco-friendly, but you’ll save money in the long run too. If you are unlucky enough to be hit by your monthly cycle whilst backpacking Sri Lanka, then I can’t recommend investing in a menstrual cup enough! Whether you choose a Moon Cup, a Diva Cup or one of the other popular brands out there now, it will make your travelling life so much easier. Out of the six Asian countries I have been to, none of them had a decent or affordable sanitary ware selection. Even when moving to China, I packed a whole year’s selection of tampons which took up a ridiculous amount of space in my luggage! A menstrual cup is actually cheap considering it is reusable, it takes up no space, it’s better for the environment and you always have access to it! It might take a few times to get used to it (just like it probably did when you were 13!) but they really are worth trying! Being an island, you can only arrive in Sri Lanka by air. There’s one main international airport at the moment and that’s in Colombo (Bandaranaike International Airport, airport code CMB). If you get the chance, fly with Sri Lankan Airlines. It was one of the best flights we have been on. The staff were lovely (and dressed beautifully! ), there was plenty of legroom (even for us being over 6 feet tall) and the food was good. We would definitely recommend flying with them! Many other airlines fly to the island though, so check prices with Skyscanner to compare the best deals. 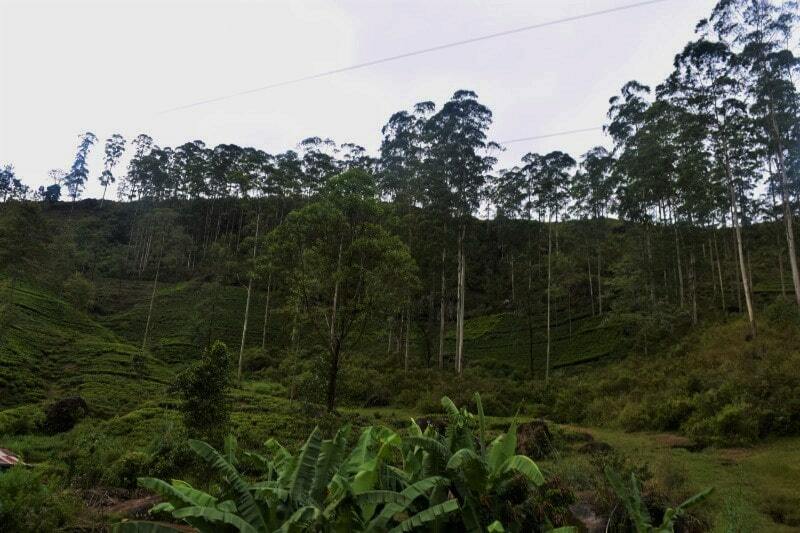 An un-missable experience when travelling Sri Lanka is to take the train through tea country. Not only are the views outstanding, but the trips also are super cheap and it’s an easy way to get from A to B. Buy your tickets at the local train stations but do be aware that the tickets do run out. You can pick different classes of seat – third, second or first. It’s actually better to get second-class tickets because they have open windows. You’ll get the best views from here. There are often snacks being brought round, such as chunky samosas, fresh mangoes and the BEST chocolate milk I’ve had! 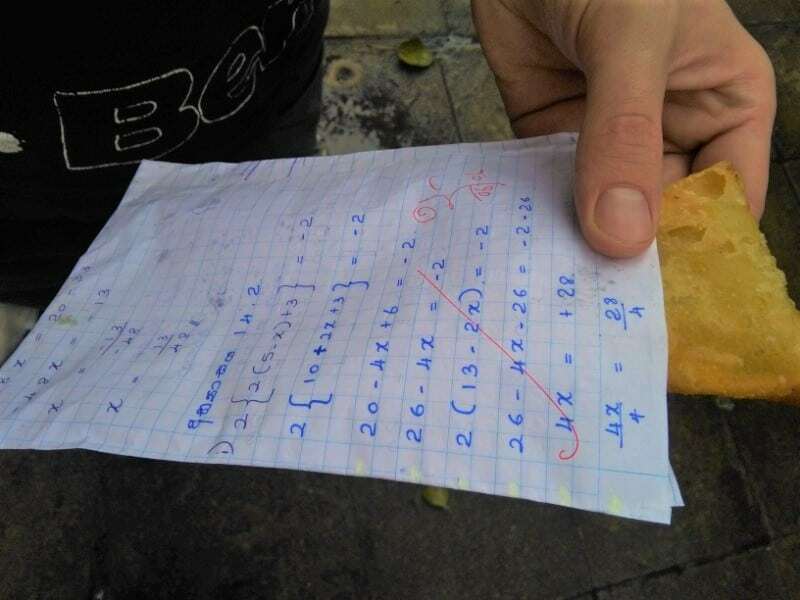 Sometimes street food will be served in somebody’s homework! Tuk-tuks are popular in Sri Lanka too. Ask your hotel to give you an idea of prices to get around the town you are staying in so that you aren’t ripped off. Buses are also easy to use in Sri Lanka. There are generally large bus stations in the popular towns, and numbers will be displayed but ask around for help. Taxis also offer long drives for a decent price. We were waiting for the bus at the Ella bus stop to go to Tissamaharama and a taxi offered to take us instead of waiting. Two other girls shared the car with us so we split the cost for a more comfortable journey. To organise your train trips, use this website. It is the Holy Grail of train and bus travel and you really won’t find a more extensive guide anywhere on the internet! Hostels aren’t as popular in Sri Lanka as Thailand, for example, but it’s quite common to stay in a guesthouse. You will usually be welcomed by a friendly family and they’ll cook your meals too. In Colombo, it was difficult to get a cheap hostel or private room close to the train station. We paid around $25 to stay in a terrible room for one night with walls that didn’t reach the ceiling and no blanket. However, there are some incredible resorts near the beaches too, so there is definitely a range of places to stay in Sri Lanka. There are plenty of awesome cities and famous sites to explore when you backpack Sri Lanka. The really good thing about the country is that it isn’t really overrun by tourists. You won’t feel like you’re just following all of the foreigners around all of the time! Of course, more and more people are discovering Sri Lanka all the time so there is a good amount of tourism, but for now, it isn’t as ‘hippy-fied’ as Thailand or Cambodia. You’ll land in Colombo and to be brutally honest, I wouldn’t recommend spending more than 1 night here. The city isn’t famed for its attractions, restaurants or accommodation. Only stay here if you have plenty of time and you want to get over your jet lag. Don’t get me wrong, wandering around the city in the daytime isn’t a bad idea, but I would stay inside at night unless you’re on a tour. Explore the food scene with a guide to tickle your taste buds and get you excited for the rest of your meals on this trip! Try to stay near Colombo Fort train station if you’re moving onto Kandy or Sigiriya afterwards because the trains start early. 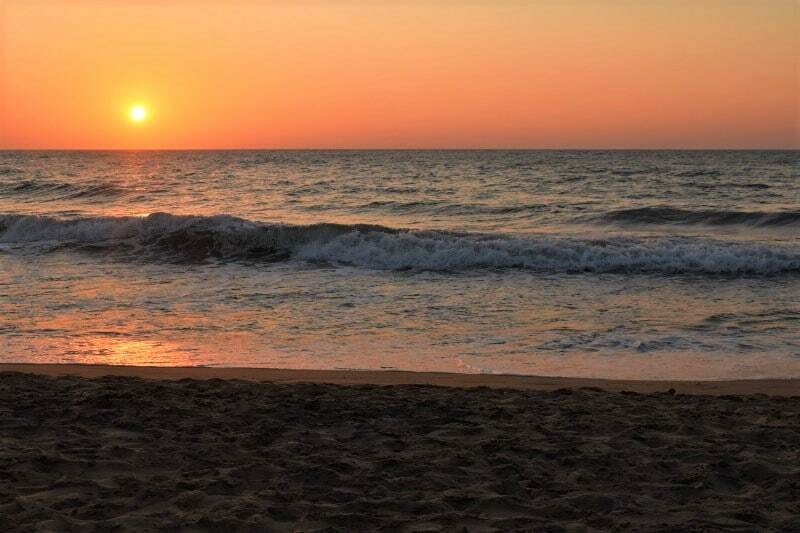 A small beach town, Negombo is close enough to Colombo to warrant staying there for a few days before your flight out of Sri Lanka. 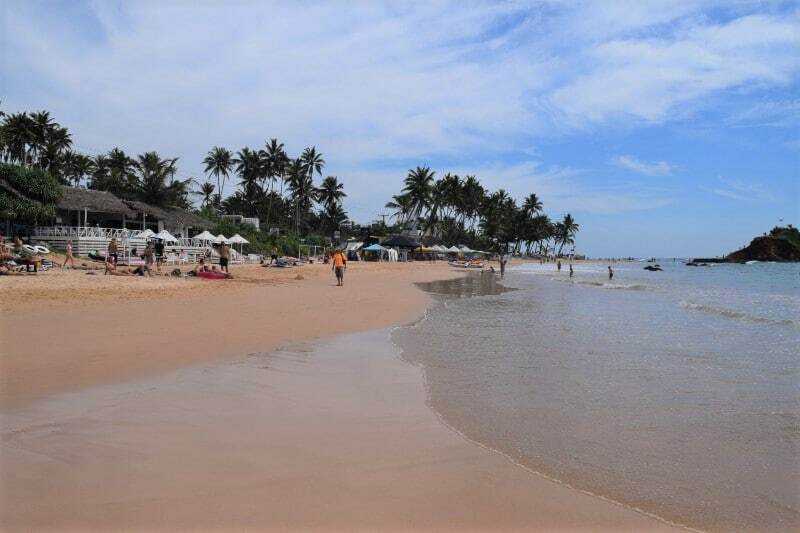 There are some gorgeous hotel resorts so if you are looking for somewhere to relax and treat yourself for a few days, Negombo is the place to do it. 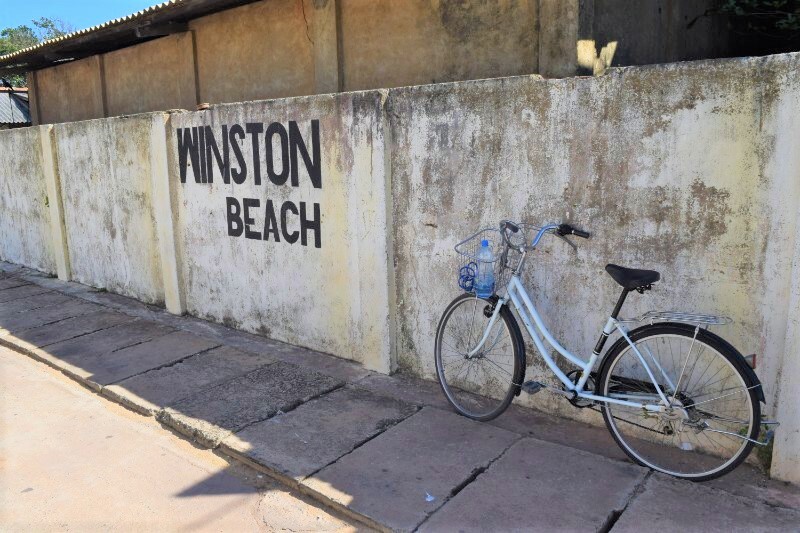 Borrow a bicycle from your accommodation and explore the main street, looking out for the beer shops that are dotted around. Watch the sunset on the beach – there will be people trying to sell you things but don’t just brush them away because they’re sellers. Some of the souvenirs are really worth taking a look at but be prepared to haggle! Consider taking a boat tour that includes a visit to the local market, fishing and lunch! The famous Lion Rock is a must-see when visiting Sri Lanka. The fact that it is a UNESCO World Heritage Site says it all! The hike up the rock isn’t terrible, but there are over 1200 stairs so you do have to be reasonably fit! You can stop for breaks though. Stay in the nearby town of Habarana and organise a driver to spend the day with you. If you book a tour, you’ll be picked up form your hotel and get a guide to share information about the local history. We’d recommend getting the train to Kandy from Colombo, as you can begin to see some of the incredible views from the elevated track that Sri Lanka is so famous for! Kandy has plenty of temples and religious complexes to explore, as well as tea plantations for miles! 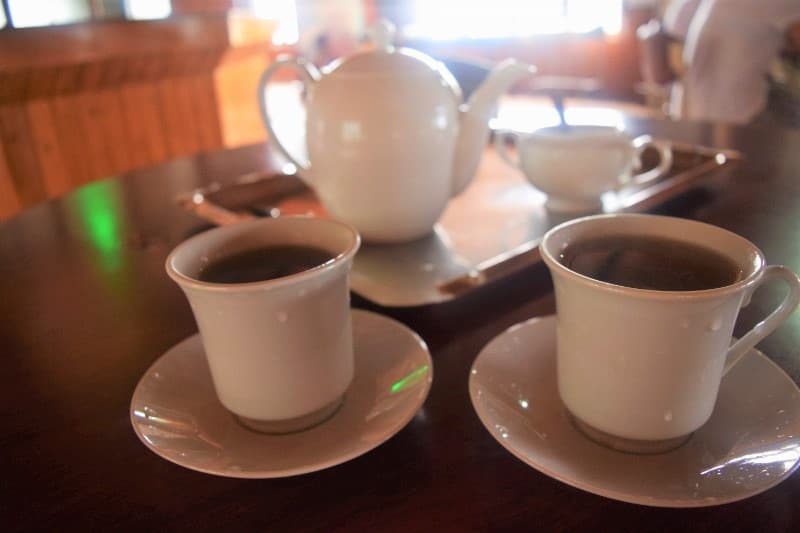 Visit the Ceylon Tea Museum to learn about the tea making process and enjoy a cup of authentic Ceylon tea! The beautiful tiny town of Ella makes the cooler temperatures and humidity caused by the higher altitude worth it! There are lots of quaint little restaurants, hostels and guesthouses catered to backpackers on the main street. Plan a hike to Little Adam’s Peak, enjoy Diyaluma Falls and take a cooking class at Ella Spice Garden. If you’re going to stay out late, organise a driver to pick you up at a certain time. Tuk-tuks aren’t commonly sat waiting to take people back to their hotels after dark. You might find yourself stranded with no choice but to pay the bar to take you at an inflated price. This part of your trip to Sri Lanka truly is a highlight. Book a safari tour and keep your eyes peeled for elephants, buffalo, monkeys and sloths! However, the real star of the show is the elusive leopard. If you’re quite lucky, you’ll see one dozing in a tree. And if you’re insanely lucky, one will stride out into the open grass and you’ll see it in all its glory. These stunning creatures are a rare find if you don’t spend the time looking! 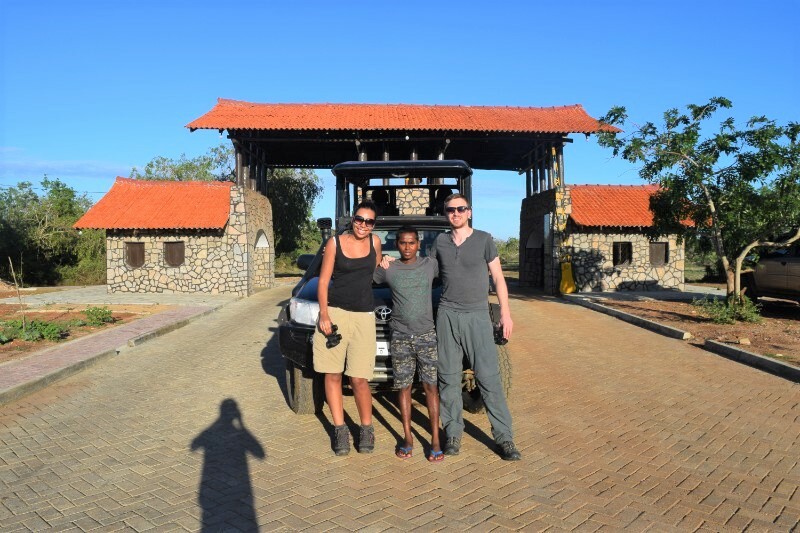 You can choose a 6 hour or a 12-hour safari, and I would really recommend taking the longer option. Twelve hours sounds like a really long time, but the time does fly when you are constantly on the lookout for more exciting animals. It also means that your driver can spend more time using their skills to listen out for the leopards. We went for 12 hours, and we saw so many jeeps stopping for a few minutes and having to move on because they had to go round the whole park. 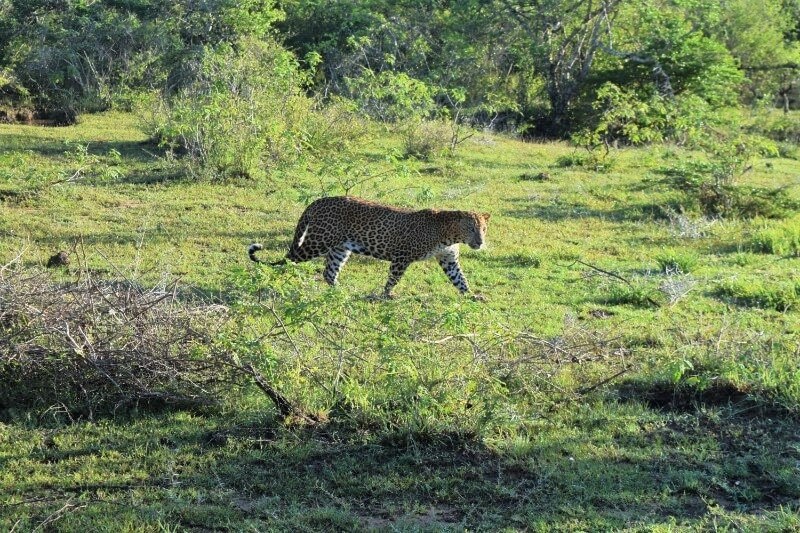 We managed to see three leopards in our time there so it really does pay off to spend longer there! If you are doing a morning or 12-hour safari, you’ll be picked up from your hotel at around 5 am so you’ll need to stay nearby. Tissamaharama is the best town to stay in. There’s not much to do there and lots of restaurants close super early so beware. 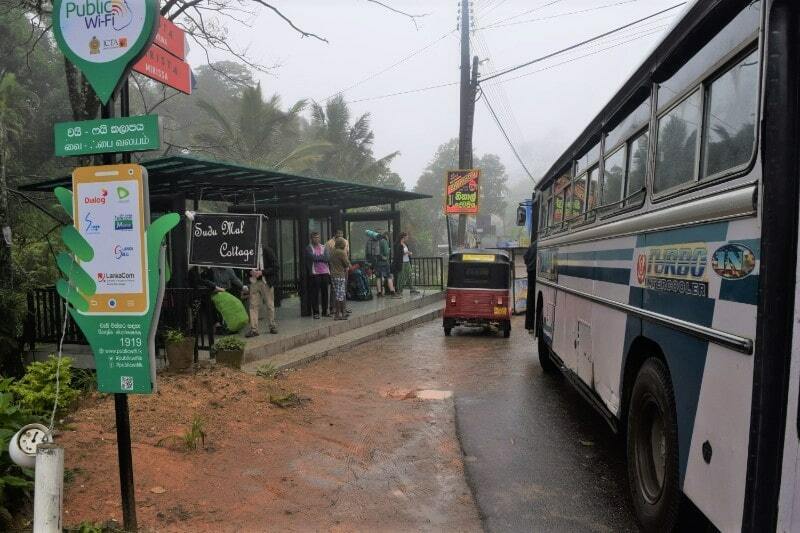 You can get the bus to the town if you’re arriving from Ella, and the bus also goes onto Matara through to Mirissa. You can also book an overnight tour, where you get to sleep in a luxury treehouse and enjoy a campfire after your evening drive. 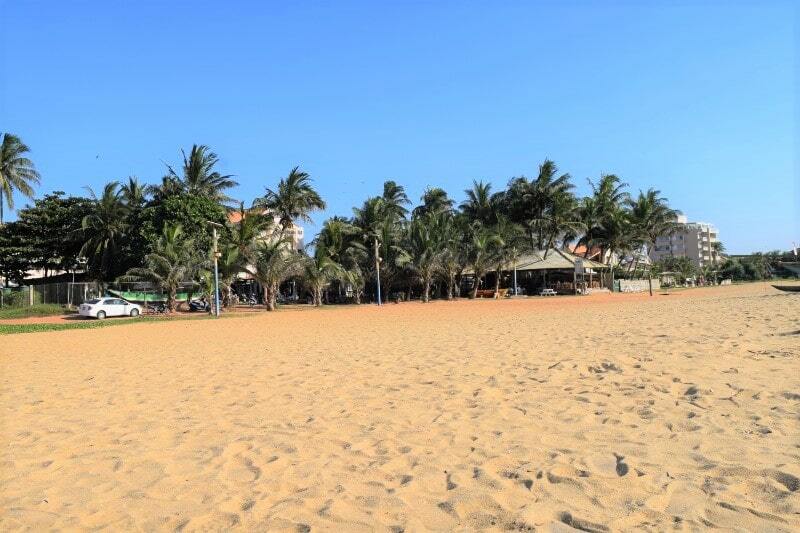 If you’re looking to laze around on the beach, Mirissa is the place to do it. There are plenty of bars and restaurants around too, and the waves are great if you want to get into the ocean for a bit of surfing or boogie boarding. 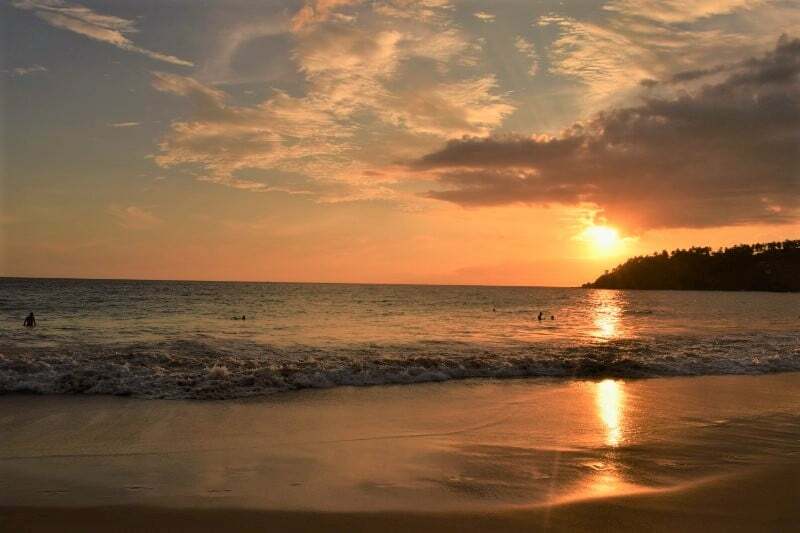 Have a look at my complete guide of things to do in Mirissa for more information, below are just some of the top tips! The real attraction here though is the blue whale. 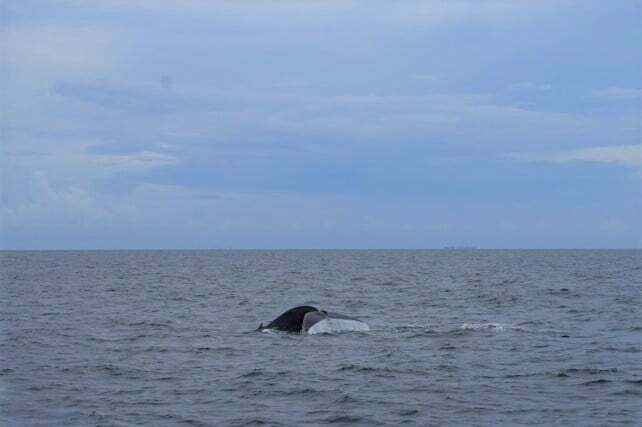 You can take a boat tour out into the Indian Ocean and go whale watching. You might even spot some dolphins too. Choose your company carefully though – some boats chase the whales and get to close which is terrible. Raja and the Whales were a good company as they didn’t get too close to the whales. They didn’t follow all of the other boats chasing the blue whales either. They also had a really informative guide on the boat, and the whole trip went really smoothly. Don’t forget to take your seasickness pills around an hour before you get on the boat too! 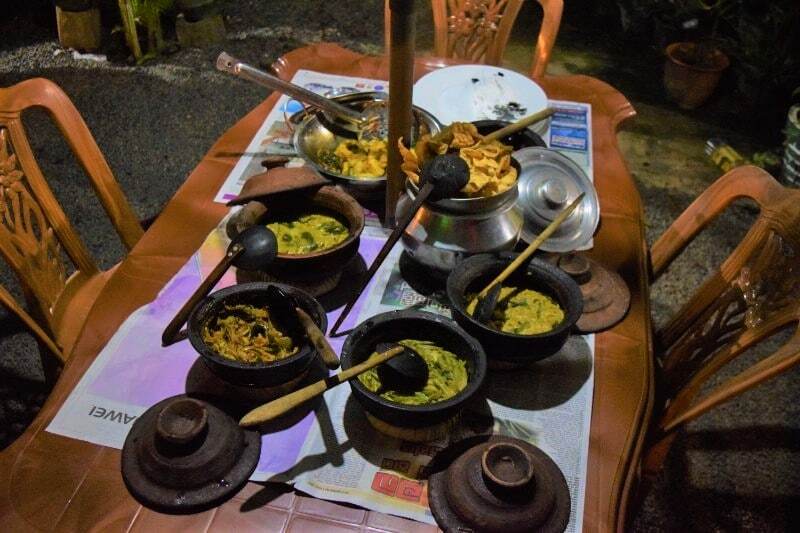 If you are interested in learning how Sri Lankan food is cooked, then you can take a cooking class at a local restaurant in Mirissa. Personally, we didn’t think the class matched up with some of the others we have taken in Thailand or Bali. The food was good though and we got a recipe booklet to take home with us. Galle is a popular spot for those interested in history. It has influences from the Portuguese, Dutch and British Colonial periods, so explore the architecture and museums. Visit Galle Fort and be transported back in time to Europe! 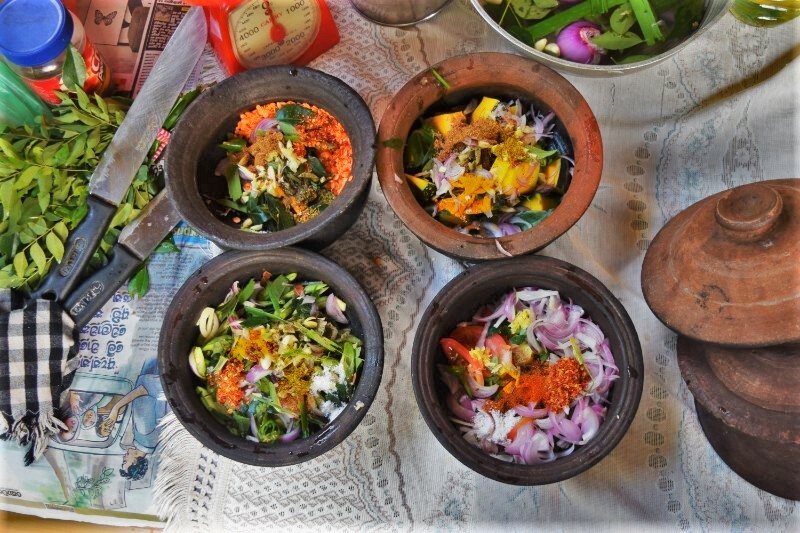 Sri Lanka has some awesome food that you will crave as soon as you leave the country! A Sri Lankan breakfast is huge and comes with a whole range of accompaniments. 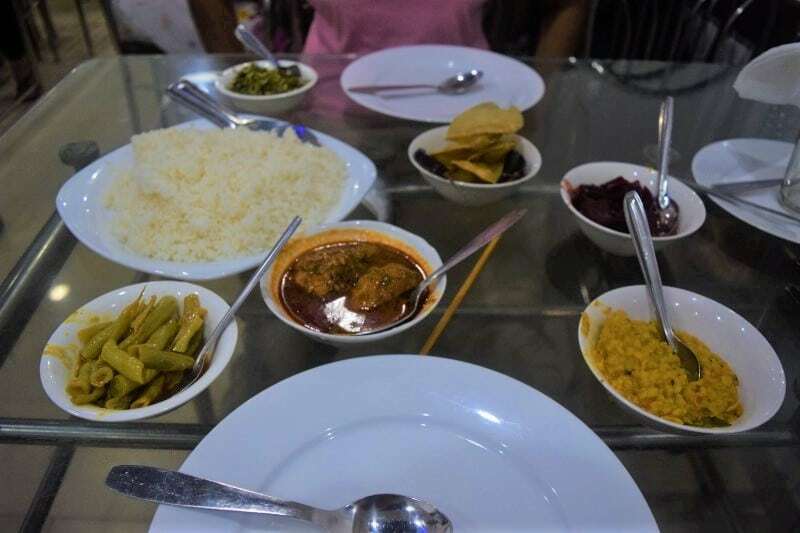 Fruits, roti, dhal, hoppers, coconut – you won’t be hungry afterwards! The main meal you’ll find everywhere is rice and curry, but it isn’t similar to Indian curry as I expected. If you order a curry for two, plates upon plates will arrive at your table. There will be curry (usually with chicken but you can ask to omit that), spicy beetroot, creamy lentil dhal, fragrant rice, sweet aubergine, curried potatoes, crispy poppadoms … it’s a pretty good feast. If you’re craving dessert in Sri Lanka, go for the curd and honey. It’s basically a thick and creamy yoghurt made from cow’s milk drizzled with honey or treacle. Lots of restaurants close relatively early, so if you’re looking for local food, remember to go at lunchtime. If you’re in a touristy area though, you should be able to grab dinner easily. When you backpack Sri Lanka, you’ll use the rupee. As of October 2018, 100 rupees is worth around £0.45, $0.60 USD and $0.80 AUD. Unlike places like Vietnam and Cambodia, you can’t use the US dollar, so change all of your money when you arrive. The exchange rate at the airport is actually pretty good, and it’s safe to do it there because there are plenty of security measures in place. There are actually multiples official languages in Sri Lanka. Sinhalese is spoken by around 70 – 70% of people. However, English is widely spoken across the country – we didn’t meet anyone who didn’t speak a high enough level of English to communicate. We always recommend learning a few key phrases even if it’s not needed – it’s just polite and people will appreciate it! There is a second language that is also used (mainly north and eastern areas) by the Hindu Tamil people. Buy a practical guidebook to help you with the phrases, or download an app that you can use offline. Being scammed as a tourist can happen in Sri Lanka, but only if you happily give out your details or money to people you don’t know! A lot of scammers rely on the fact that many locals are super helpful and friendly, so tourists don’t know the difference between the two. There are also the typical pickpocketers, inflated tuk-tuk prices and ATM scams. These can happen anywhere so just be aware of your surroundings and keep your belongings close to you. Wear a concealed money belt when you’re out and about and don’t flaunt expensive items around. Someone you just met might offer you a really cheap tour so you think they are being friendly, but instead, they take you round to pre-planned shops and restaurants. You’re then pressured into buying things you don’t need and the scammer pockets commission. If you want to book a tour, consider doing it before you arrive in the country with a reputable company like Get Your Guide. Or, you might visit a temple and someone shows you a card with photos of a physically disabled person on. They will claim that any donations you make will help the person in the photo, but the likelihood is that the money just goes into the scammers’ pocket. If you want to give some money, do your research beforehand into official charities. One of the more worrying scams that can happen involves real police who have become corrupt. Usually traffic police, they can stop you and demand that you pay a fine for something that you didn’t actually do. Always ask to be taken to the local police station to settle any issues (if you HAVE actually done something wrong then still do this!). If you’re really concerned, get in touch with your embassy. Never hand over your passport to a police officer in the street because they could also demand money for you to get it back. Whilst accidents do happen, the only way to make sure that you don’t pay financially for them is to be insured. World Nomads have extensive travel insurance options that will cover you for most things. They also offer the added bonus of being able to take out cover if you are already abroad. If you have forgotten to get insurance, you are extending your stay and need a different type of cover or you are an expat and have health insurance instead of travel insurance, then World Nomads are a great option to get covered. 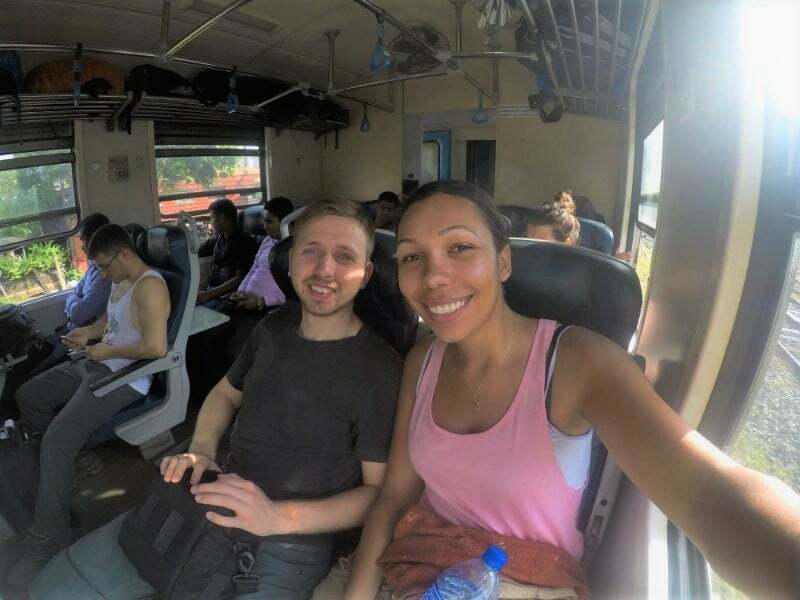 We absolutely loved backpacking Sri Lanka! We were slightly unlucky with the weather whilst taking the scenic trains trips. There was lots of cloud and mist so we didn’t see too much of the view but we still had a great time on the train. The food was probably our favourite of all of Asia. There are literally so many flavours and textures, and it’s wonderfully cheap. We also saw a leopard walk past our jeep less than 5 metres away and watched two more snoozing in their trees. You just can’t do that in many other countries! Sri Lanka will always be high up on our list of best places to visit for that alone! We didn’t ever feel hassled or scammed by the locals, and so many people spoke English. The accommodation was probably the worst thing about Sri Lanka. It was expensive to get close to some city centres and we often were unable to get an air-conditioned room. However, if you are prepared to pay a bit more then you can find some gorgeous villas and hotels. Go to Sri Lanka before it becomes too busy, crowded and expensive. It’s a magnificent country with flawless scenery, friendly local people and wonderful wildlife for you to meet. Despite being a small island country, you can spend a month here and not get bored. If you are pushed for time though, I would recommend spending at least 10 days in Sri Lanka. For one person, a daily budget of around $25 should be enough to include accommodation, food and cheap activities. 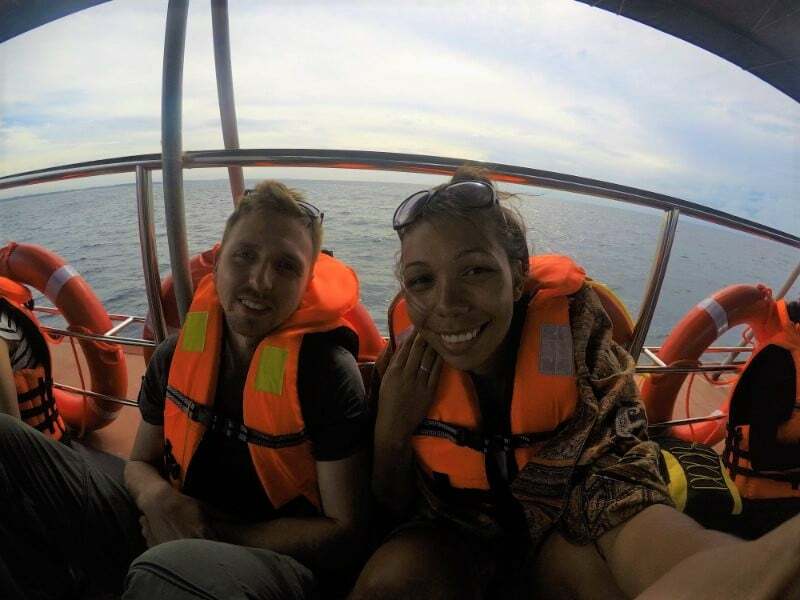 However, if you are planning on doing a whale watching tour or a safari, make sure you budget for these separately as they can be quite expensive. Mobitel or Dialog are probably your best bet when buying a sim card in Sri Lanka. Pick one up at the airport before you venture out and you’ll be good to go. Sri Lanka is so scenic throughout that you’re almost guaranteed to see gorgeous views whichever train you get on. However, the pictures you see on in Instagram and Pinterest most likely come from between Kandy and Ella. Yes, you can, but there isn’t really a drinking culture there. You’ll find large bottles of Lion beer everywhere, and you can buy alcohol from designated ‘beer shops’. Don’t expect to be partying until 3 am anywhere though! Sri Lanka was declared malaria-free in 2016 by the World Health Organisation! Buddhism is the main religion in Sri Lanka, but there are also many Hindus, Muslims and a minority of Christians. Tipping is actually quite an important part of the Sri Lankan service industry. Whether it’s for a waiter in a restaurant, a tuk-tuk driver or a tour guide, if you receive good service then it is good manners to tip 10%. Are you planning to backpack Sri Lanka? Let us know if you have any questions!